For generations, Americans have packed a lunch and snacks, or purchased food at workplace cafes or nearby restaurants every workday. It was all something employees did on their own — outside of what would be considered part of a management strategy. But that’s changing, as employers begin to examine the connection between what and how workers eat and the work they produce. This sounds a bit far out, I know. But I already see more companies starting to think about food strategically, and I am convinced it will only become more prevalent. Ethical and transparency issues. There may be a significant risk that a firm’s employees will feel that they are being manipulated by Big Brother. Employee input will need to be factored into the design and the communication of any “managed food” effort. Influencing the mind. Using food and energy drinks to increase mental capacity, alertness and creativity could create unintended consequences. Every firm will be striving to spur more innovative ideas and creativity, but there are likely to be many health concerns associated with any effort even to try to boost or alter mental capacities. Weight gain. Exposure to constantly available free or subsidized food can lead to health- and morale-damaging weight gain. Some firms have been experimenting with subtle approaches that reduce caloric intake, such as keeping only healthier foods in abundant supply in work cafes. Work/life balance. There is evidence that serving breakfast, lunch, dinner and after-work snacks causes employees to come early and stay late. Although this might help productivity and attendance, it may also negatively impact work/life balance and even family life. Food creates conversation. 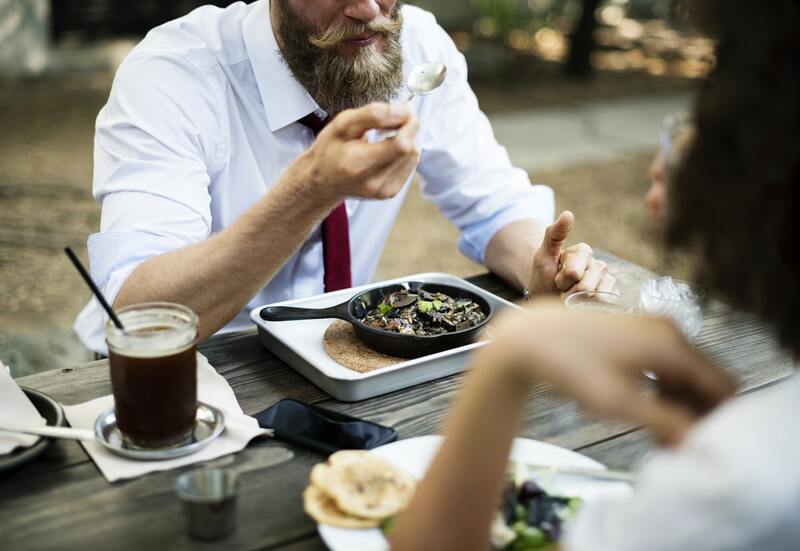 There is some evidence that the process of sharing food among disparate employees who are not on the same team helps to maintain the culture and to increase collaboration dramatically. However, firms will have to use data to learn how to best design the food-delivery process so that it maximizes employee information sharing, collaboration and interactions. External impacts. If a significant percentage of businesses in an area were to offer on-site food for free, it could have a harmful impact on local restaurants. Recruiting potential. Market research reveals that the availability of great free food is a powerful retention factor. But it can only serve as a powerful recruiting factor if firms learn how to effectively market it so that prospects can literally “feel the excitement” around eating and sharing food at your firm. Smaller facilities. Small businesses and facilities that simply don’t have space for full food service will be at a recruiting and retention disadvantage. Maximum impact. Given the wide range of food preferences and food allergies, data will have to be collected on the type and quantities of food to serve to increase both energy and wellness. A positive return-on-investment. Because a data-driven approach will be required for success, in addition to food costs, firms will have to invest heavily in building the capability of making food a productivity tool. So a strong data-driven business case will have to be built to convince skeptical executives and shareholders that the benefits will exceed the cost. As seen on The Wall Street Journal, October 15, 2017.